I figured we would start with the basics. 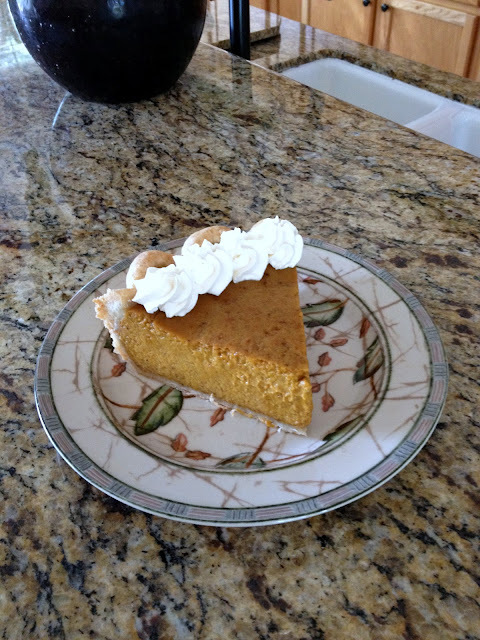 Pumpkin Pie is one of my all time favorites. It was absolute heaven on a plate! Yes, I'm aware...I take an obscene amount of pie pictures! You should see my iPhoto folder, it's atrocious! * For the exact pie above, I used a 9.5 inch deep dish pie plate and 1.5 the recipe above. The above recipe is perfect for a normal 9 inch pie plate. Prepare dough. Flute pie crust and place in freezer until it's hard as a rock. Preheat oven to 425. Combine the sugar, salt, and spices in a small bowl. Beat the eggs in a large bowl. Whisk in the pumpkin and sugar-spice mixture. Gradually stir in the evaporated milk. Pour into the chilled pie shell. Place the pie on the center rack and bake for 15 minutes. Reduce the oven temperature to 350 and rotate pie 180 degrees. 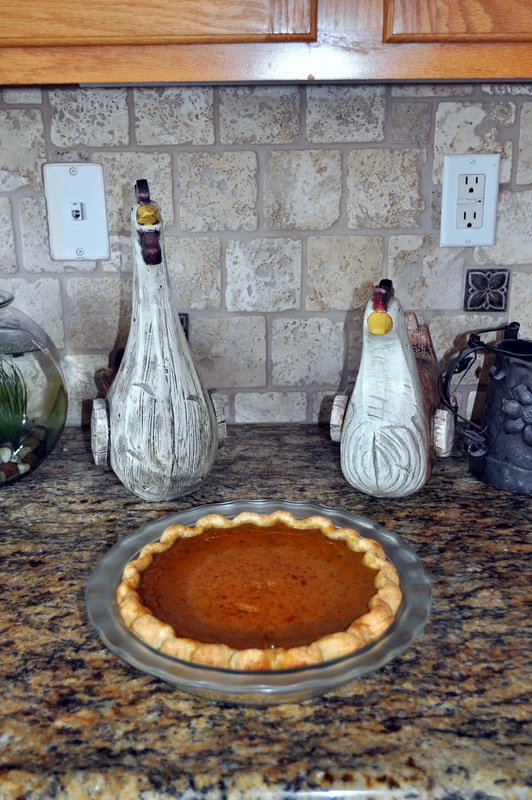 Make sure to continue checking the crust edges, and place a pie protector on once needed. I put mine on at 33 minutes. Continue to bake until a knife inserted near the center comes out clean, 40-50 minutes. My oven is like fire and it took a total of 52 minutes. Transfer pie to wire rack and let cool 2 hours. Serve immediately, or cover with loosely tented foil and refrigerate before serving. Garnish with whipped cream, if you wish! WHAT???? You don't evaporate your own milk???? You don't make your own pumpkin puree????? Well these are the same ingredients I put in MY pumpkin pie!! Except I don't measure, I just throw it in because I, too, love spices. I think recipes are just guides. BTW, I have actually have made a pumpkin pie out of my own pumpkin. It was AWWWWWEEEE-sum. I was going to do the same thing again this year but the kids' pumpkins went bad before I could make it. Oh, and my crust is a little different. You see mine comes out of the freezer too, but in a roll wrapped in plastic in a box marked "Pillsbury Frozen Pie Crust". I wanna be NEAR you. Oh, and obviously... I LOVED your husband's halloween costume. You should name future pie shop "Pie Lady" because it's pie LADY, not pie MAN! And that's a scientific FACT. You and Cameo are over-achievers. Our pie is coming from Shari's which is just a notch above Mrs. Smiths. Pumpkin pie, you're right, this is a classic. Your whip cream always looks so pretty!